- CLICK ON PROMOTION FOR OFFER. Only 11.99 through end of. Free Ebook- Will Bring Tremendous Value Showing and Explaining how to benefit your Whole upper body. Thick bars cause an increased use of much more muscle fibers in the hands, forearms, upper arms and whole upper body leading to bigger gains and bigger muscles. Using BIG GRIPS will work your entire upper body. The science behind the benefits of BIG GRIPS is explained in the free e-book included with purchase. Benefits of Big Grips: ncreased muscle size and strength, a thicker handle boosts your muscle stimulation which translates to bigger muscle mass and strength in your forearms, hands and the entire upper body. Build your grip strength - having a thicker grip will build your forearm strength automatically which will increase the power of your grip. Big Grips work the whole body when done right. Fewer imbalances and injuries - Reduces joint pain by shifting stress off the joints by spreading the weight across a larger surface area and onto the muscles and relieves stress and pressure on wrists, hands, and fingers. The neutral grip position of BIG GRIPS is proven to reduce elbow strain. Carry on the go - Our grips fit easily in your luggage, gym bag, small tote bag, back pack, glove compartment and even a purse. Size: Length: 4 inches Outer Diameter: 2 inches Inner Diameter: 1 inch. Our grips are made of 100% food grade silicone, so they are safe, non-toxic and are virtually indestructible even with the toughest workouts. ★EBOOK: (Coming end of February. 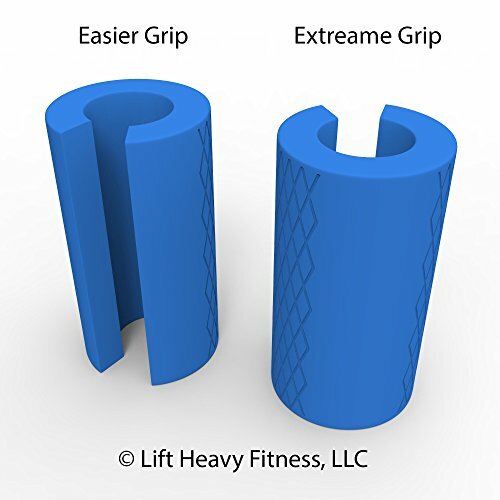 Everyone who has ordered these will be emailed it) Explains how to maximize benefit of Big Grips Grip Strengthener: The 11 Best Exercises for total body workout and how to increase resistance for continued use. ★ FITNESS ACCESSORY ATTACHMENTS - For dumbbells, pull ups, barbells, EZ-CURL bars, cable machine attachments, farmers walk, bench press and more. Because of the adaptability you will see great muscle growth and strengthening. ★MOST USEFUL FOR- bodybuilders, cross fit, powerlifters, weight trainers and lifting, rock climbing, MMA, UFC Or whoever else is looking to greatly increase power from your fingers to your waist and every muscle in between, there is a use for EVERYONE.